As we get older, the risk of getting all kind of diseases increases progressively.  Therefore the goal of research on growth and differentiation factors is to succeed in intervening on aging process and preventing pathologies caused by cellular degeneration. 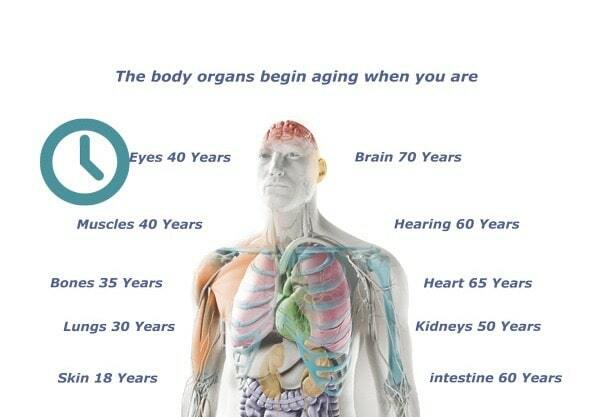 Aging is not a disease but a natural process triggered by the cells aging. 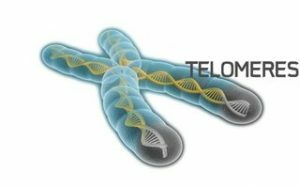 With no telomerase activity the telomere of the chromosomes of the cells in active proliferation shorten progressively; when telomere length falls below a critical threshold, stem cells stop dividing and die. Therefore elderly telomeres are shorter than those of young people. 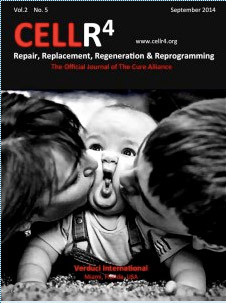 Longevity is a balance between genes and environment, when this relationship is meant as a way in which life habits interact with genetic heritage. In this sense we must see the aging process too, i.e. always bearing in mind that genetic heritage can be modified consecutively. Today thanks to the growth and differentiation factors we are able to keep the telomeres always long, even when the cell divides. Growth factors allow the cell to make her telomere re-grow as it spontaneously occurs in youth. 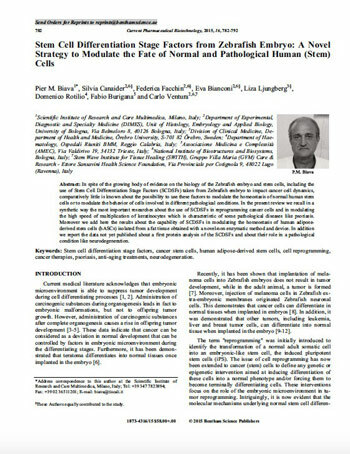 These are the results produced by a collaboration of 23 Italian universities on new frontiers of cells reprogramming, aimed to determine fate of healthy and pathological stem cells and define incredible regulatory activities of the code that organizes life: the epigenetic code. The studies on functioning of the epigenetic code made it possible to understand that what had been studied was in fact the code of regulation of gene expression. This code is present in its totality and with all its different functions only at the moment when life is formed. In this moment this code could be studied and understood in its global functioning, even if subdivided and divided into different stages of differentiation. In fact if all the substances present in all the different stages of differentiation had been obtained, we would have had the entire epigenetic code available, that is the code able to regulate all the genes of all the cells that make up an entire organism. In other words we would have had the whole code that regulates life: the “Code of Life”. This possibility of studying the epigenetic code in its entirety exists only in the embryo and only in the moment when all the organs and systems differentiate. In that period from a single totipotent stem cell (the fertilized egg) there is a differentiation of all types of stem cells through various stages: pluripotent, multipotent, oligopotent cells, cells in process of definitive differentiation and finally completely differentiated cells. Once the organogenesis is over, it is no longer possible to study the entire epigenetic code in its whole extent and with its different functions. In fact, when the organogenesis is terminated, the epigenetic code is divided into various organs and tissues and every organ contains that part of the code which serves to control and regulate gene expression of the cells of that specific organ, and there is no longer a possibility of studying all the different and incredible functions of the “Code of Life”. Therefore only in that moment when it was decided to study the epigenetic regulation code, i.e. during the period of differentiation of various organs and apparatuses, it became possible to study all the different and incredible regulatory capacities of this code. And that is what has been done, choosing first of all an embryo as a study model for cell differentiation: i.e. in this case the embryo of Zebrafish. The study of the entire epigenetic code and its functions has led us to fantastic discoveries. These different functions are here briefly described in order to make it clear what great opportunities the study of the code of life offers. For the first time in the world it has been identified a fraction of the epigenetic code which has proved to be able to naturally maintain, without genetic manipulations, stem genes responsible for preventing cellular aging (these are the same genes that Shinya Yamanaka, who won the Nobel Prize in 2012, had artificially introduced within a retrovirus in a differentiated cell. This cell however cannot be used without risk precisely due to the undergone manipulations, which modify the cellular cyclicity and keep the cell in a phase of continuous multiplication. In our research, instead, the cells increase the duration of their life without being manipulated, based only on a physiological regulation of the stem genes. In fact if the administration of these factors is stopped, the cells return to age, thus demonstrating that they have not lost their cyclical nature and normal physiology). The cellular life increase occurs thanks to the impediment of telomere cutting, that is the terminal part of the chromosome composed of repeated sequences of DNA. The function of telomeres is to protect the termination of chromosomes, to allow cell division, to protect against aging and cancer. The telomere prevents the progressive degradation of chromosomes what could bring to the loss of genetic information: telomeres in this way act as a sort of biological clock, linked to a maximum number of DNA replications, at the end of which the cell becomes too old for being kept alive. At that point the cell undertakes the path of programmed cell death and thus concludes its life cycle. The factors isolated in our studies not only prevent the cutting of telomeres, thus lengthening the life span of cells, but also activate other genes, such as Bmi-1, which induce the synthesis of various proteins responsible for preventing cellular senescence. Therefore these factors, which can only be obtained in specific and well-defined moments of stem cell differentiation, not only increase the duration of life, but keep the cells young, preventing them from aging. This is a very important point, considering that if we only lengthen the life span, but we leave cells grow old, then the risk is to be at an old age having numerous health problems and a considerable physical decay. Fortunately the factors we isolated do not allow cells to age and thus the increase of life span can be associated with a good psycho-physical condition. At this moment the factors that had shown an anti-aging activity have been used to prepare specific creams. These creams have proved to be highly effective as they have been able to significantly reduce wrinkles on the face and décolletage. 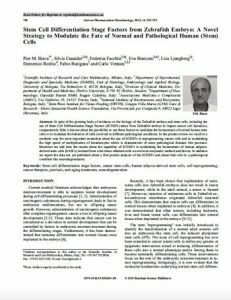 These results, which were obtained with the help of factors isolated during the differentiation of specific types of stem cells, are almost impossible to obtain by artificial manipulations of the genetic code. This is because different genetic manipulations can’t transfer complete information able to increase the duration of life and at the same time to block cellular senescence. At this point the limits of scientific reductionism emerge even more clearly. As growth and differentiation factors are biological and physiological, they have no side effects. 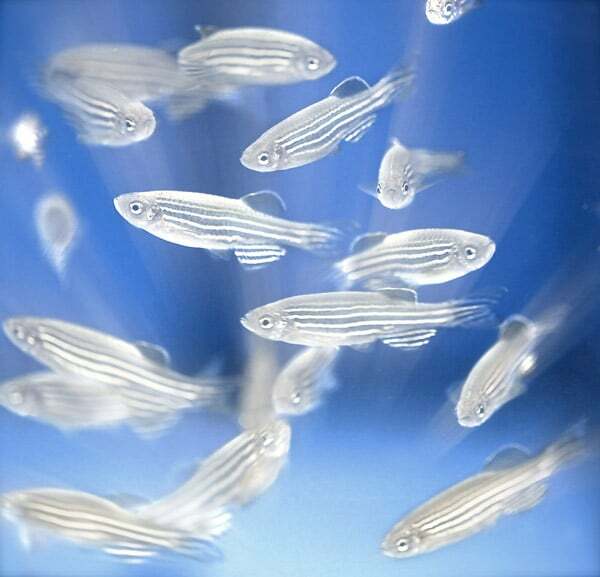 A proteins analysis of embryo extract from zebrafish embryo has been performed. A suspension of the glycerol-alcohol solution was analysed by means of the monodimensional electrophoresis gel (SDS-PAGE). 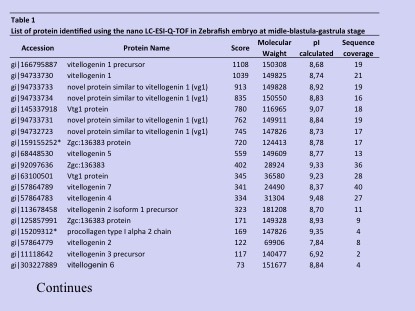 As shown in the figure below, there have been identified three major groups in all 5 phases extracted, distinguished by their molecular weight: over 45 kDa, about 25-35 kDa and below 20 kDa. 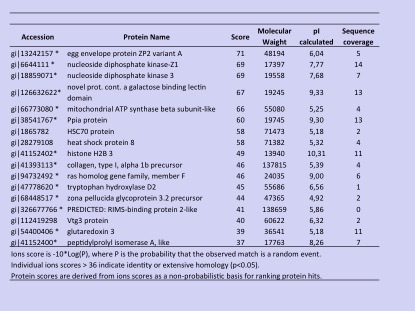 In any case, the relative amount of proteins is different in the 5-stage samples.